TerraMaster’s D5 represents a significant step forward for this Noontec subsidiary. Offering everything missing in previous models, and boasting speeds of up to 1035 MB/S, the D5 is aiming for the professional storage market. Let’s see if this RAID box is worth the $800 price. The D5 looks almost identical to the D5-300C, with the addition of a chunky carrying handle on the top. It uses the same TerraMaster drive bays you may know and love, and even uses the same buttons, chassis, and lights. Now that’s a lot of features! The dual Thunderbolt 3 interfaces Thunderbolt 3: What It Is & Why You Need to Start Using It Thunderbolt 3: What It Is & Why You Need to Start Using It Thunderbolt 3 may just be the only device cable you need to know about anymore. It's so awesome that it's making everything else obsolete. Here's what you need to know. Read More allow you to daisy-chain other Thunderbolt devices, while the DisplayPort is able to drive a 4K display such as the BenQ EW3270U. With a maximum capacity of 60TB, you won’t be running out of storage space anytime soon, but if you do, the alternative D8 is an eight-bay variation. The D4 is a cheaper four-bay version, but we think the D5 represents an excellent balance between capacity and affordability. If you choose to use mechanical drives instead of SSDs, you can install an optional SSD as a flash cache. This is a great idea and as an excellent way to boost the speed of your array. Automatic RAID rebuilding, hot swapping, hot standby, and bad sector remapping are all pro features that you may not need right now, but to see features like these on a consumer level device is a welcome change. Seeing so many features included in a model from TerraMaster is a welcome change. Previous models have provided good to excellent performance, but have sometimes been lacking in features. If TerraMaster will continue to build upon this solid foundation, they could soon become a household name. Inside the box, you’ll find the D5 alongside a power supply, mounting screws, tools, stickers, and a 1-meter long Thunderbolt 3 cable rated to20-Gbps. This cable is a strange choice, given that Thunderbolt 3 can run at 40-Gbps. While you’re unlikely to ever saturate a 20-Gbps cable right now, it’s something that has the potential to limit your connection speed in the future. It would have been nice to see a full-speed Thunderbolt 3 cable in the box, especially given the price. If you install SSDs into the D5, you won’t experience any vibrations, and you’ll encounter very little noise. Noise and vibrations do increase with mechanical drives, but the fans do an excellent job at cooling the drives without excess noise, heat, or vibrations. A price of $800 is enough to make you think twice about purchasing the D5, especially when it doesn’t include any drives! While this price may seem high, it’s about equal with other Thunderbolt 3 RAIDs. When you look at the speeds the D5 is capable of, along with its huge spec sheet, it almost seems like a bargain. RAID management is carried out through TerraMaster’s Raid Manager Pro software. This can be hard to find on TerraMaster’s sometimes cryptic website, but it generally works well once installed. A RAID driver is available alongside Raid Manager Pro. Windows and Mac OS downloads are available, but Linux is not supported. If you’re running Windows, you can run the .exe file, but it’s much more complicated to install on Mac OS. You don’t need a degree in computer science to run this program on a Mac—but it helps! There’s no installer. Instead, you’ll need run the build script, or execute a series of commands via the Terminal. This is unacceptable for a modern software package and feels like you’re contributing to an Open-Source software package, instead of installing a RAID manager. The D5 has got it where it counts, and it can deliver on its claimed speeds when writing data and comes pretty close when reading. For our testing, Kingston sent us five of their 480Gb UV500 SSDs. Capable of transferring data at 520 MB/s for reads, and 500 MB/s for writes, and with excellent hardware encryption, and reliability, the UV500 series SSDs are the perfect match for this Thunderbolt RAID. With five UV500s configured as a RAID 0 array, the speeds you can achieve are quite stunning. We were able to achieve 977 MB/s read and 770 MB/s write. This may not sound great considering the speed each individual SSD is capable of, but there is still some logic involved with RAID arrays, and speeds approaching 1 GB/s are excellent, especially for an external drive. As RAID 0 provides no fault tolerance, and SSDs are decreasing in price daily, it would be a costly process to build a huge capacity RAID with only SSDs. For a more traditional test and a fault tolerant system, we installed four 4TB Seagate HDDs and configured a RAID 10 array. Mechanical HDDs spinning at 7200 RPM are much slower than SSDs, but you do gain a slight performance boost from the RAID alongside redundancy and fault tolerance. With 16TB configured as RAID 10, the total available storage is 8TB. The D5 achieved very respectable 444 MB/s read, and 439 MB/s write speeds. This is excellent and almost starts to approach the speed of a single SSD. Considering the price and storage capacity of traditional HDDs, RAID 10 provides the best compromise between storage space, speed, and reliability. Not sure on the different RAID types? Our RAID explained What Is RAID Storage & Can I Use It On My Home PC? [Technology Explained] What Is RAID Storage & Can I Use It On My Home PC? [Technology Explained] RAID is an acronym for Redundant Array of Independent Disks, and it’s a core feature of server hardware that ensures data integrity. It’s also just a fancy word for two or more hard disks connected... Read More guide may clear things up. 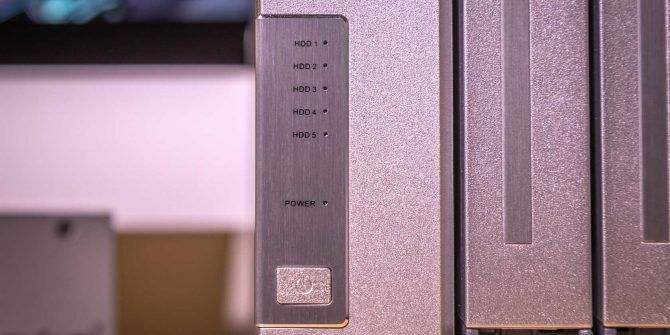 As the D5 can use the full 40 GB/s provided by Thunderbolt 3, it’s possible to run a 4K monitor, transfer data through the whole raid, and daisy-chain up to seven devices. Whether that’s worth the cost of admission is up to you—we think it is. The D5 Thunderbolt 3 is an expensive choice, but it’s worth it if you need the speed or capacity it offers. Basic home users may want to look elsewhere for cheaper options, but for the working professional, up-and-coming YouTuber, or redundant storage fan, the D5 is an excellent choice. When compared to the price of similar Thunderbolt 3 devices, the D5 comes up as one of the cheaper options. Let down by the troublesome Mac software installation, the D5 follows TerraMaster’s tried-and-tested hardware design, along with a huge number of premium features. Explore more about: Hard Drive, MakeUseOf Giveaway, RAID, Storage. For $US799 I would buy a standalone NAS from Synology instead and possibly get more drive bays as well. Nice. Purchasing? Maybe early in the New Year after the Christmas fund suckage has passed. Not even saturating a t2 connection, what's the point of t3 on this? The software is basic highpoint, newtech, owc clone stuff so no excuse for not having an osx install. Any drive with 4 bays SSD in raid0 will trounce this. Why the glowing review? Ffs, spinning drives in raid to USB 3,1 gen2 tops this! Joe is a graduate in Computer Science from the University of Lincoln, UK. He's a professional software developer, and when he's not flying drones or writing music, he can often be found taking photos or producing videos. Blackview P10000 Pro Review: Is That a 11000 mAh Battery in Your Pocket…?